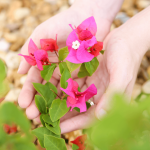 If you’re cursed with the dreaded brown thumb, you know the utter hopelessness of achieving the luscious garden you’ve always dreamed of. But it doesn’t have to be that way! Good news: there are easy plants you can grow that don’t require a lot of babysitting. Some even thrive on neglect! Even if you don’t plan on selling your house anytime soon, you’ll probably list it someday. So start with the project that offers the biggest bang for your buck and make it your top priority this summer. Psst… some of the easiest updates cost nothing but offer tremendous ROI! No more boring flip-flops! 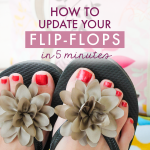 All you need is 5 minutes and $5 bucks to turn a plain pair of sandals into fancy footwear. This step-by-step tutorial is a fun Mother/Daughter project, or doubles as an activity for a girly birthday party. 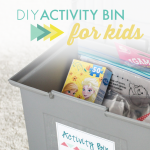 Keep kiddos quietly entertained with this simple DIY Kids Bin. Rotate different activities in and out every month, and you’ll have hours of creative play at your fingertips! 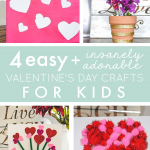 These Valentines Day crafts for kids are not only cute and adorable, they’re also crazy easy to make! Most of the supplies come straight from the dollar store, which means you can have a thrifty afternoon project within minutes. Don’t waste your time scrolling through “thousands of candy jar ideas”. 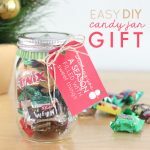 This is THE DIY candy jar you’ve been looking for!! Quick. Easy. And oh-so-cute. 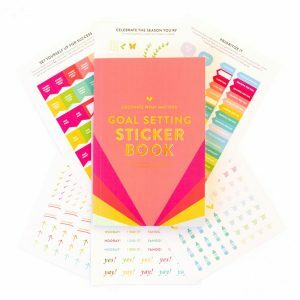 Perfect for teachers, co-workers, and friends! Think handmade gifts take a lot of time? Think again! 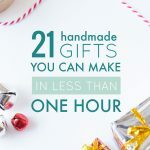 These 21 easy handmade gift ideas take less than an hour to make and are guaranteed to get those creative juices flowing. Knock out a bunch this weekend and get your Christmas list DONE. 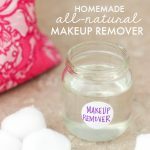 Tired of overpriced makeup removers? This recipe uses just 3 all-natural ingredients and is super nourishing for your skin. It’s a homemade recipe that actually WORKS! Keep those pesky weeds from ruining your latest landscaping project. 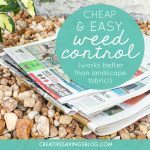 This unique form of weed control is easy, effective, and barely costs a thing! Proven to prevent weeds even better than landscape fabric.